Moon Village’ is a concept that seeks to transform the paradigm shift referred to unprecedented international cooperation in space exploration and the new approaches of Moon exploration and exploitation into a set of concrete actions and create an environment where both international cooperation and the commercialization of space can thrive in a sustainable manner.Moon Village brings together efforts from the private sector, governments, academics and others to explore and use the Moon in a sustainable manner. Realizing the Moon Village will be a major step forward for the peaceful development of humankind. The Moon Village is not a literal village on the Moon, it is not an International Space Station on the Moon, and it is not a single science facility. Rather, it is a diverse community of projects carried out by stakeholders from different fields (for example, technical, scientific, cultural, economic) working together under the auspices of lean coordination mechanisms and/or common standards (i.e., technical, and ethical), and globally harmonizing existing resources to reach further-term aims. It acts as a catalyst for new alliances between public and private entities, including non-space industries and operators. Additionally, the Moon Village will provide a strong inspirational and educational foundation for future generations. A basic feature of the Moon Village is the principal of broad international cooperation. Through this, it can catalyze government, scientific research, education, and industry activities globally, stimulating a virtuous cycle of economic development by all and for all, which represents a key factor for the peaceful future of humankind. The Moon Village concept comprises a wide range of activities, with elements ranging across automatic/robotic activities, human-tended operations and eventual human settlement to achieve sustainable lunar orbital and surface operations, serving multiple purposes on an open-architecture basis. Government and private funding will provide the resources to build necessary equipment and facilities by industry allowing scientific research and creation of new products and services. The infrastructure to be built will also foster the creation of a governance and contractual framework to support the economy of new markets. Specifically, a significant value of the Moon Village will be its role as a proving ground for missions further out in the solar system. Consolidate a compelling shared vision of the Moon Village that fosters a sense of belonging and inspires a group of people to create it together. Support the creation of a new open dynamic that includes ideas from space agencies, commercial space, donors, philanthropists, and citizens from all countries. Stimulate global awareness of the prospective benefits of the Moon Village, with arguments about how individuals, countries, regions, and the environment will benefit from establishing a permanent presence on and near the Moon. Facilitate discussions with financial industry experts and entities with the goal of establishing the necessary financial means to support the development of the Moon Village and associated economic activities. Create a paradigm shift in how international space missions are being designed – toward faster, lower cost, more creative and collaborative approaches. Foster the Moon Village vision to society at large to engage citizen worldwide. 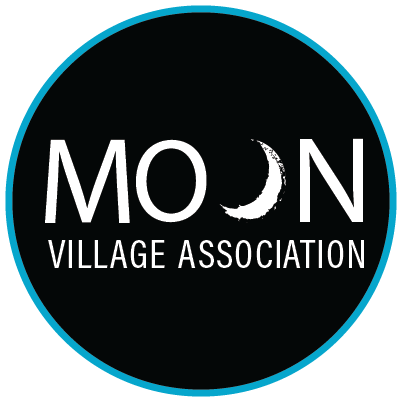 Act as a representative of the civil society and international space community in the decision-making process which is assessing or related to the Moon Village concept. Neutral: Politically neutral, which means that no organization or country will have a predominant role in opportunity to participate in formulation of the Moon Village concept. Global: Global endeavor that aims to promote the participation from as many countries as possible, including those countries who do not have the budget to contribute with hardware to the MVA but that can contribute with ideas, capacity building, and awareness efforts. Inclusive: It is inclusive of all disciplines from scientific to humanistic. It endorses a holistic approach to the next giant step of Humankind. Cooperative: It seeks to avoid duplication of efforts with other stakeholders like Space Agencies and industries, but encourages creation of synergies on all Moon-related topics by providing a forum among all stakeholders. Not formal: Participation is largely informal, meaning that governments and Space Agencies can join with an in-kind contribution only, and no requirement for a formal ratification of activities or need to elaborate official policy positions. Consensus building: Will help to create a consensus on different topics. For example, by reaching an agreement on a standard for Moon mission’s communication or rule of cooperation without any formal bilateral agreements by the stakeholders. Participative: Open to all stakeholders including the public. The public has always been excluded in the creation and implementation of space programs. The MVA aims to involve the public in the definition of the MVA by creating awareness and opening the possibility for individuals to join in. Autonomous: Funded via individual and institutional membership and also through the sponsorship of events. Unique Platform: Similar platforms exist, but are mainly thematic organizations like the LEAG (Lunar Exploration Advisory Council), which are mainly scientific as well as others involving space agencies (i.e. ISECG, ISEF, ILEWG) but none of those have a ‘all in one’ approach.